The dog days of summer have arrived. For some, that is signified by the smell of grilling hot dogs and hamburgers. For others, it’s the sound of the ice cream truck. For me, it is the process of marinating and grilling a flank steak. There is just something about it that urges me to shuck some corn, whip up some lemonade, and send the kids out into the sprinklers (okay, sometimes I like to join them, too). Since I am such a salt hound, I prefer my flank steak to be marinated in some sort of soy sauce mixture. That’s how I came up with this marinade. I usually just eyeball the amounts, but I have done my best to estimate for this recipe. Be careful not to marinate the flank steak for longer than 2 hours so that it does not become over-salted. Yes, there is such a thing, even for my sodium-saturated taste buds. 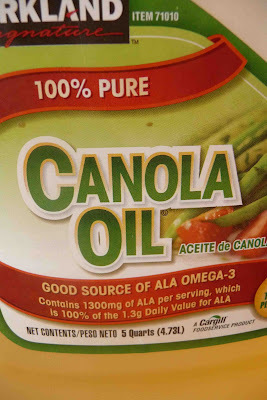 3 tbp canola oil and 3 tbsp rice wine. Sorry, I forgot to take a photo of the rice wine. 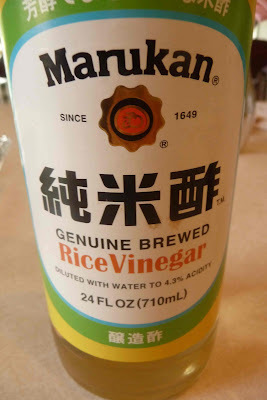 I’m sure you can use your imaginations – big bottle, lots of liquid, label that says, “Rice wine”. Add 3 cloves of chopped garlic and 2 tsp grated fresh ginger to the soy sauce mixture. 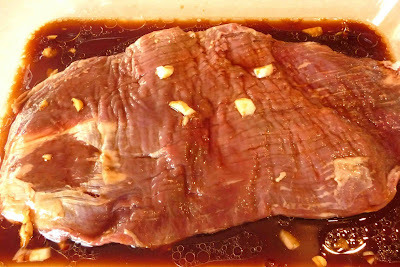 Add a 1 1/2 pound flank steak to the marinade and turn the flank steak so that both sides are coated with the marinade. Cover and refrigerate, and allow the flank steak to marinate for 1-2 hours. 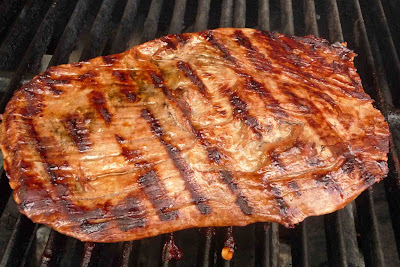 Remove the flank steak from the fridge 20-30 minutes before grilling so that the steak comes to room temperature. Preheat your barbecue to medium-high heat. Place the flank steak on the barbecue and cook it for about 7 minutes on each side, or until the flank steak is almost medium-rare. Remember, the internal temperature of the flank steak will rise an additional 5-10 degrees F after you remove it from the grill. Even if you are someone who typically likes your meat medium to well-done, I urge you to try it with a little more red in the center. It makes the difference between a steak that is somewhat satisfying and one that is juicy and flavorful. Let the steak rest for 10 minutes so that the juices can be absorbed back into the steak. If you cut into the steak before it rests, the juices will run higgledy-piggledy onto your cutting board. More juices on your cutting board equals less juices in the steak. Thinly slice the flank across the grain and serve. When I made this last weekend, I served it over some spinach and cold peanut noodles. It was a delicious combination. Into a 9-inch by 13-inch dish, combine soy sauce, rice vinegar, canola oil, rice wine, chopped garlic, and grated ginger. Whisk together. Add the flank steak to the marinade and turn the flank steak so that both sides are coated with the marinade. Cover and refrigerate, and allow the flank steak to marinate for 1-2 hours. Remove the flank steak from the fridge 20-30 minutes before grilling so that the steak comes to room temperature. Preheat your barbecue to medium-high heat. Place the flank steak on the barbecue and cook it for about 7 minutes on each side, or until the flank steak is almost medium-rare. Let the steak rest for 10 minutes so that the juices can be absorbed back into the steak. 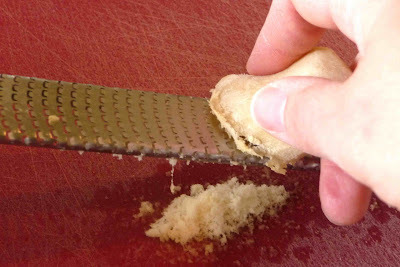 Thinly slice the flank across the grain and serve. Soy and ginger are two of our favorite ingredients – especially when thrown on a nice piece of steak! Looks delicious! Wow! Amazing dish looks so tasty ! 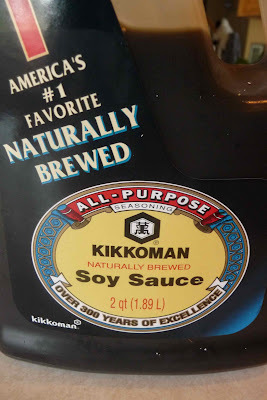 I love the flavor or ginger and soysauce . Join post your comments share your recipe . That looks amazing! Love the marinade! 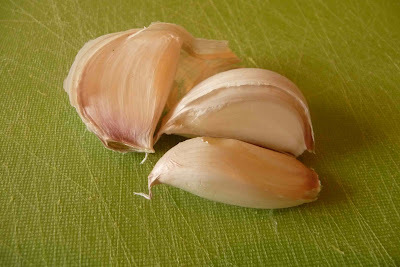 Soy, ginger and garlic are definitely a must have in kitchen ingredients. Looks awesome over the bed of noodles. 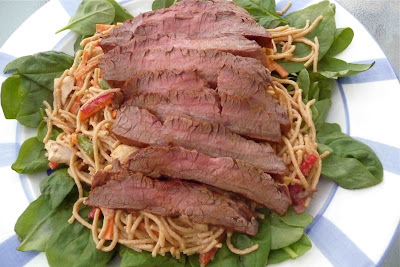 Such a tasty way to use flank steak! Yum! 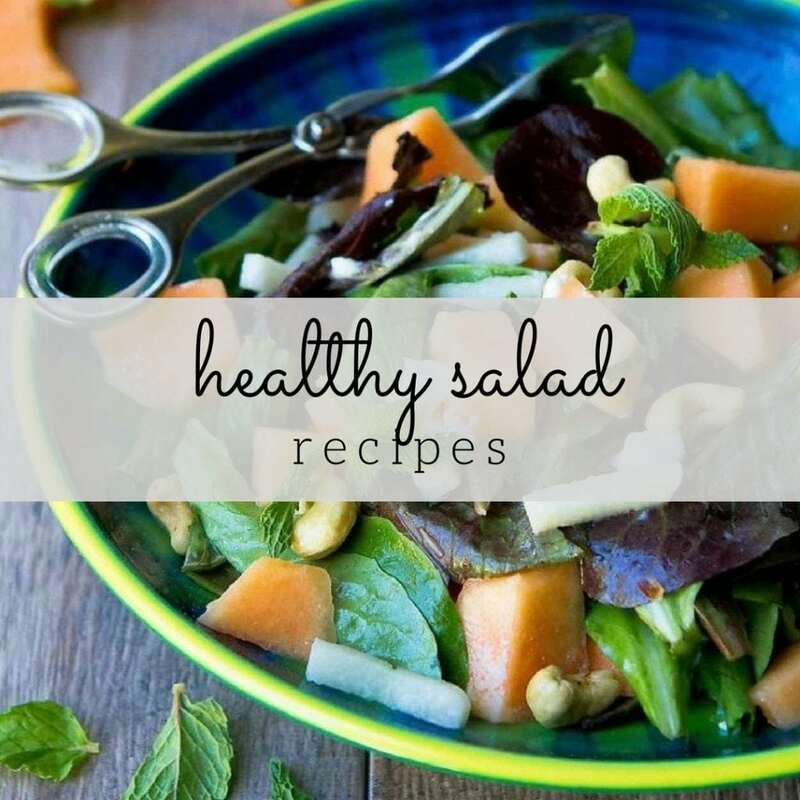 Very interesting recipe, I love the ingredients you used, will try it soon! 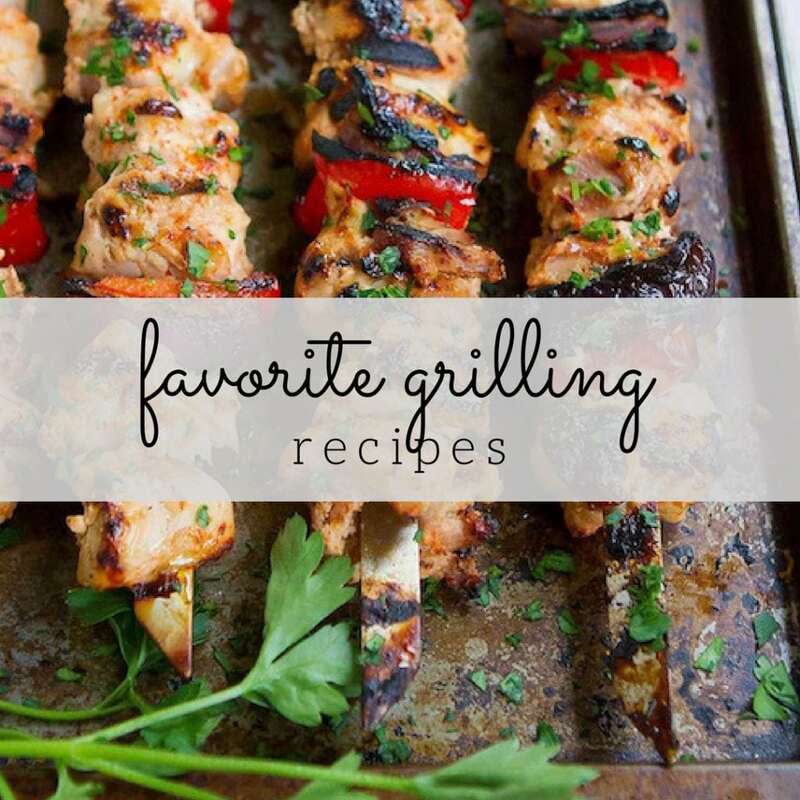 The marinade sounds simple and delicious! Look at that lovely meat grilling away – and it's even better on the noodles! First of all, this looks absolutely terrific. But I also wanted to mention that I think it is wonderful to link other recipes using flank steak from other sites. VintageMixer, I have been to that Asian store, but we also have the "China Market" in Sandy (on 9000 E., just west of State St.). The prices are so reasonable and the selection is really good. Angie, the chili oil sounds like a great addition. Miranda, I'm glad you like the links. We all love options, right? I am literally drooling! Asian fusion is a love of mine and this dish just puts 2 of my favorite dishes together – marinated steak and cold noodles. 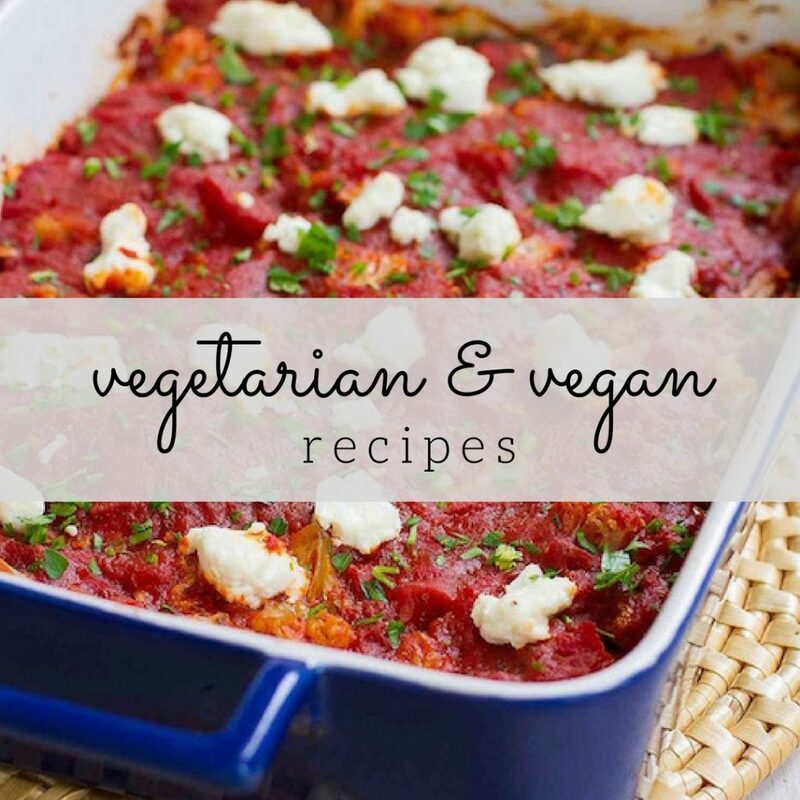 You have such innovative and mouth watering recipes on your site, I can get lost looking at all them! Done! I'm so making this for dinner tonight. I'll let you know how it goes!